I really enjoy cooking with fresh herbs or making the occasional side salad. However, I hate going to the grocery store and buying a huge container of field greens or basil, only to have half of it rot in the refrigerator before I get to eat it. I thought a much better solution would be to grow my own herbs and greens and then pick them as I need them. This way I would always have the very freshest ingredients, without any waste or extra trips to the grocery store. 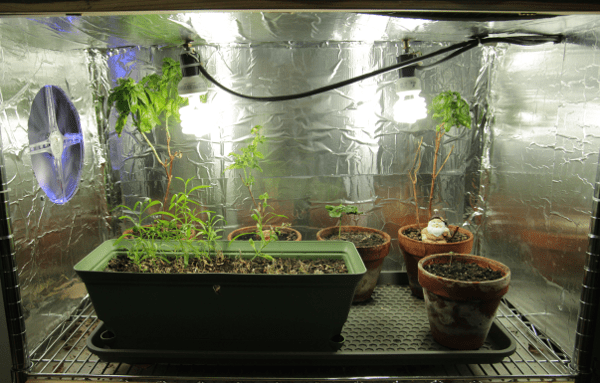 I built myself a simple grow-light setup to grow herbs and greens, and eventually some vegetable seedlings. I like the idea of having everything automated. There is no sense in saving yourself a trip to the store just to spend a couple hours a week tending to some plants. 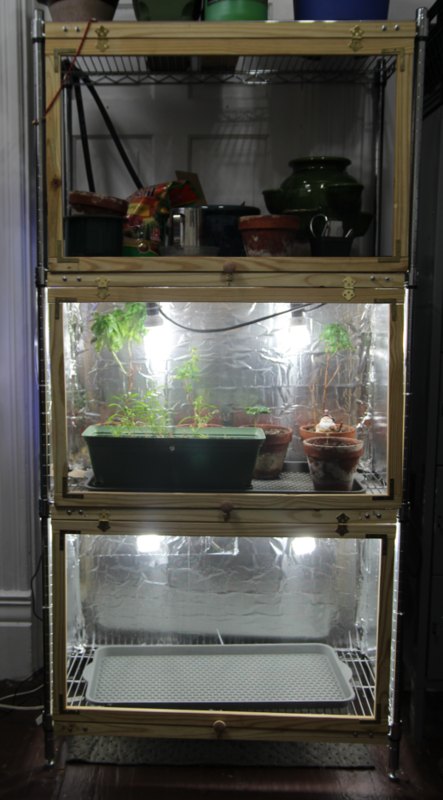 Using some collapsible metal shelving, I created a three compartment grow light rack. I created the top, sides and back from corrugated twinwall plastic and used spray adhesive to line them with aluminum foil. To the top of each shelf, I secured two regular light bulb sockets and wired them all into a single junction. I am using basic 27 watt, 6500k wavelength CFL bulbs. I also added a 200 mm PC fan to each shelf to generate air circulation. I have all of the pots sitting in a plastic tray so that I can water an entire shelf by pouring water into a single tray. Lastly, because my girlfriend’s cats kept using the soil as liter boxes, I fabricated a screen door and latch for each shelf. I have the entire thing running off an electric timer. Its very low maintenance and now I have regular greens and herbs. No, I’m not using this to grow pot, so don’t ask.